Hope is an interesting concept. In the secular world it is a fingers-crossed kind of emotion where you make a wish and hope it comes true. In the education world hope can often be a glass-half-full optimism; if you have a strong sense of self-efficacy you will most likely succeed at what you try. In the Bible hope is something all-together different. It is not fingers-crossed or glass-half-full, it is a grave-completely-empty assurance of God's love for us. We have hope that heaven awaits our arrival because we have assurance that our entrance into heaven has already been earned for us through Christ's death and resurrection. 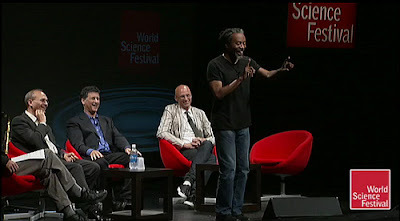 Here is a World Science Federation tape of Bobby McFerrin. In this activity where Bobby turns an entire audience of science nerds into a musical instrument where they can sing one line while he sings another is a fascinating thing to see. At the end of the clip Bobby gives us a reason why this works. Apparently the pentatonic scale is hardwired into our brain. When he proceeds to teach the audience how to sing this way he has confidence that they can access this information and put it to use in this situation. We are hardwired to know God. He has placed His law into our hearts and through the miracle of baptism has also placed His love and Spirit. Because of the faith He gives us, we have the possibility of knowing and feeling His love and care. We have the kind of hope that is an assurance, that is definite, that is as certain as God himself. At the beginning of the clip Bobby talks about expectations. Bobby does not have to use any words to teach the audience the game. He uses his actions and their understanding of the pentatonic scale to teach them how to anticipate or expect the next note. The audience can instantly perform because of the many years of exposure to the scale. The audience is not lagging behind their teacher, but, is in sync with his teaching. God has placed His word into our hearts but He has also demonstrated His love for us over and over, again. He has set up a pattern of expectations just as Bobby McFerrin set up an imaginary xylophone. God's pattern is complete and completely consistent. Our hope is an assurance and an expectation. May you be led by God's teaching and rest in the assurance of His hope. He has great plans for you and has written those plans in your heart. This video still amazes me. Thanks again for coming to talk to us and teach us about ways to teach our kids in faith. May God bless your school year and the work you do with His children.